Thanks for the article Erin; good information, as always. I notice that sys.dm_db_stats_properties() suffers from the same problem in SQL 2016 as it did in previous versions (and as sysindexes.rowmodctr did too) in that it tracks the number of row modifications rather than the number of distinct rows modified. (I call it a problem, because in my view it is, even though this behaviour is no doubt by design.) This makes it impossible to tell the difference between a single row in a million row table being updated a million times and every row in a million row table being updated once each; in the first instance you wouldn’t need to update the associated stats, and in the second instance you probably would. 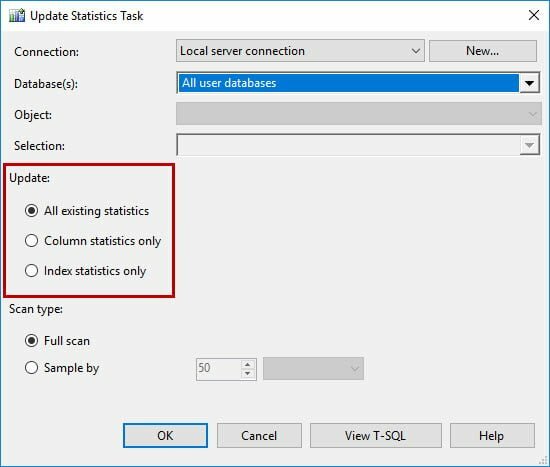 Without being able to distinguish between the two, it makes it near impossible to make wise decisions (in code) about whether or not to update specific column or index statistics. Have you heard anything from Microsoft or in your professional circles that would suggest Microsoft are planning to address this behaviour anytime soon? I don’t have any insight as to whether Microsoft will change the way it determines modifications. But, consider what would have to happen to track modifications *per* row. Right now SQL Server just tracks a change. What you’re suggesting would mean that it would have to track *which row* changed and how many times. How expensive is that? For a small system, not bad, but for a large, high-volume environment with thousands of transactions per second (and potentially thousands of modifications per second), you’re adding overhead by trying to monitor what row has changed. I think submitting a Connect item requesting the change is worthwhile, but I’ll be honest in that I don’t see that being implemented easily or soon. I understand that tracking *just* modifications may not be as reliable in terms of your stats updates, and then it comes down to knowing the application. If you have large tables where ONLY one row is updated, I’d be really interested to understand the logic there. Is this something you see frequently in the databases you support? Of course the real problem is picking a trigger point. For example, I have a Partitioned View that contains rolling, date-based sub-tables. Each week a new table is created and added to the view. The table receives about 30GB of data in 225M Rows at a pretty constant rate 24X7. The query references are almost all Insert or Select (minimal updates -no deletes). After a few weeks the table is rolled out of the view, truncated, and dropped. The data is keyed by a combination of a sort of device number (Int, TinyInt) (about 10,000 discrete devices) and a generally increasing datetime. I am thinking of just tracking the #Rows in the sub-tables in the meta-data that controls this process and then update stats after ?? rows are added. With a table created each week, then you should just have to monitor that one for modifications, correct? If so, then yes, I would just look at the most recent one or two tables and look at modifications, and maybe do an update based on number of rows AND percent changed. Meaning, if you’re adding 225M total, you don’t want to update stats every 1 million rows. You want to update stats when a percentage of data has changed…and I would guess that over time, even if you change 10% of the data (22 million rows in a “worst case” scenario), you probably don’t need to update stats because unless something REALLY crazy happened, you’re not changing the distribution of data that much. So, when the first maybe 10-20 million rows are added, I expect you’d update more frequently than you would once you have 100 million rows. Does that make sense?